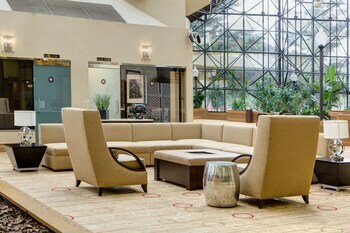 Located in Newark, DoubleTree by Hilton Hotel Newark Airport is connected to the airport and close to Prudential Center and Newark Museum. This hotel is within the vicinity of New Jersey City University and Kean University. Make yourself at home in one of the 502 air-conditioned rooms featuring flat-screen televisions. Wireless Internet access (surcharge) is available to keep you connected. Private bathrooms with shower/tub combinations feature complimentary toiletries and hair dryers. Conveniences include phones, as well as desks and complimentary weekday newspapers. 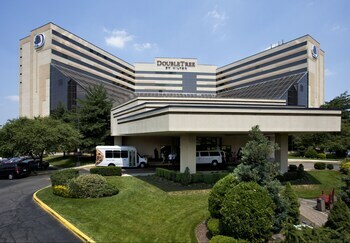 DoubleTree By Hilton Hotel Newark Airport is an ideal Newark lodging choice for your trip to New Jersey. With numerous amenities for guests such as 24 hour front desk, fitness center, gift shop, you will wake up at DoubleTree By Hilton Hotel Newark Airport feeling ready to go every day for your time in Newark. Don’t let this amazing reservation opportunity pass you by, book your stay at DoubleTree By Hilton Hotel Newark Airport today to make the most of your time in Newark, New Jersey.